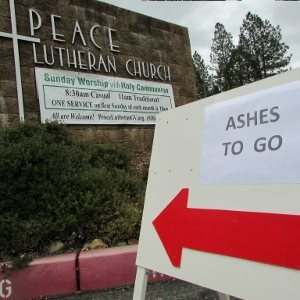 Ashes to Go! Get your Ash Wednesday blessing with our drive-thru system. Just follow the red arrows around the building to the carport. 7:30-8:30 a.m. Wednesday, March 6 – If you can’t make it to one of our worship services, get your blessing on the way to work! Ashes To Go is our drive-through offering. Follow the signs to the portico on far side of the building, then roll down your window. The pastor will touch the ashes to your forehead and bless you while you sit in your car. 12:15 p.m. and 7 p.m. Wednesday, March 6 – In the Sanctuary. Our Ash Wednesday services offer a beautiful time of solemn reflection. We try to grow more aware of the ways in which the world calls us to vain, shallow, self-absorbed and self-destructive pathways. We open our hearts to God’s amazing, generous, all-forgiving love. Our response to God’s lavish love is to feel amazed and humble. It’s as if our big fat egos burn to ashes in the light of God’s grace! We want to do better. We want to live lives of light! On Ash Wednesday, the symbol we take for this vow is ashes — a traditional sign of repentance. Then, we faithfully trust in God’s power to redeem and renew us! During today’s prayer services, you will be invited to come to the altar to receive ashes on your forehead. But you don’t have to if you don’t want to! Music during the service will help evoke a sense of amazement. I might be a total mess, but God loves me, feels my pain, lifts me up! God dusts me off, gives me a big hug and send me back out into the world. I am renewed with fresh strength — because it’s God’s power, not my own! 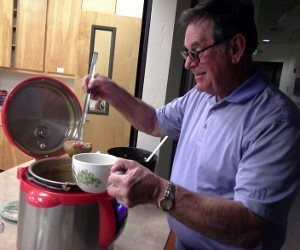 Enjoy simple soup suppers with fellow pilgrims at PEACE Lutheran Church. 6:15pm Thursdays in Lent, starting March 14. For the rest of this season of reflection, we invite you to our Lenten soup suppers and prayer services. We hold them starting at 6:15 p.m. every Thursday through Holy Week. This is a time we use to prepare our hearts to experience, with Jesus, his suffering and death – done for our sake! LENTEN PRAYER SERVICE every Thursday in Lent starting March 14, following the Soup Supper. We know that a “new life” awaits us with the Glory of Easter! Fat Tuesday – People may be more familiar with Mardi Gras, or Fat Tuesday, the day before Ash Wednesday. In many countries and in parts of the United States, it’s a moment of partying and revelry before the somber mood of Lent kicks in. Traditionally, one of the “sacrifices” of Lent was eating bread without leavening. So in some communities still, people make lots of waffles, pancakes or lefse to use up eggs and other leavening they may still have in the kitchen.